Jackie Myers, the athletics director at Meredith College, has always looked up to legendary basketball coach Kay Yow. In many ways, it’s fair to say that where Yow has gone, Myers has followed. She played basketball at Elon for Yow in the early 1970s, despite not playing high school basketball because Morehead High School in Eden didn’t have a team then. When Yow was hired as the coach at North Carolina State University after Myers’ freshman season of 1974-75, Myers followed the coach to Raleigh. But N.C. State was too big for her, and after a semester there, she returned to Elon to pursue a teaching and coaching path. Myers continued to be a trailblazer, playing three sports. Yow was inducted into Elon’s sports hall of fame in 1986, and Myers followed with her induction in 1990. And the two stayed in touch, through summer softball. When Meredith, a women’s college just down Hillsborough St. from N.C. State, hired Myers as AD in 2002, one of the first calls she got was from Yow, who invited her for a round of golf. Myers remembers Yow, who died of cancer 10 years ago, as much for her humility as for her Xs-and-Os acumen. People say the same thing about Myers, who in her own way has led Meredith’s Division III program, with no scholarships for athletics, to new heights. The Avenging Angels compete in eight sports, three of which have been added since Myers took the job. 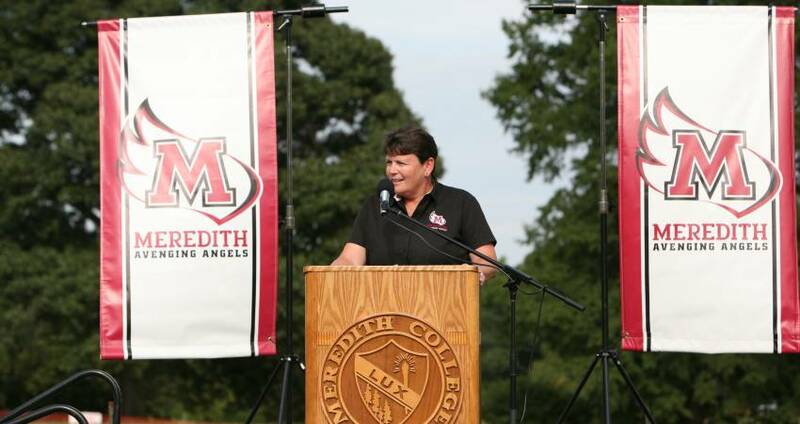 In addition, Meredith went from NCAA independent to a member of the USA South Conference, where it has won 25 conference titles and qualified for NCAA postseason play 14 times. What was strong was Meredith alumnae’s love of the Angel. Some in the college community didn’t want a change. But there’s a new fierceness along with a nod to the school’s past. At a Division III school where staffs and budgets are often small, Myers has to do a little bit of everything. Public address announcer for lacrosse games? Yes, Myers did that. And, until the last few years, she regularly set aside AD responsibilities to teach classes in badminton, tennis and other sports to students. 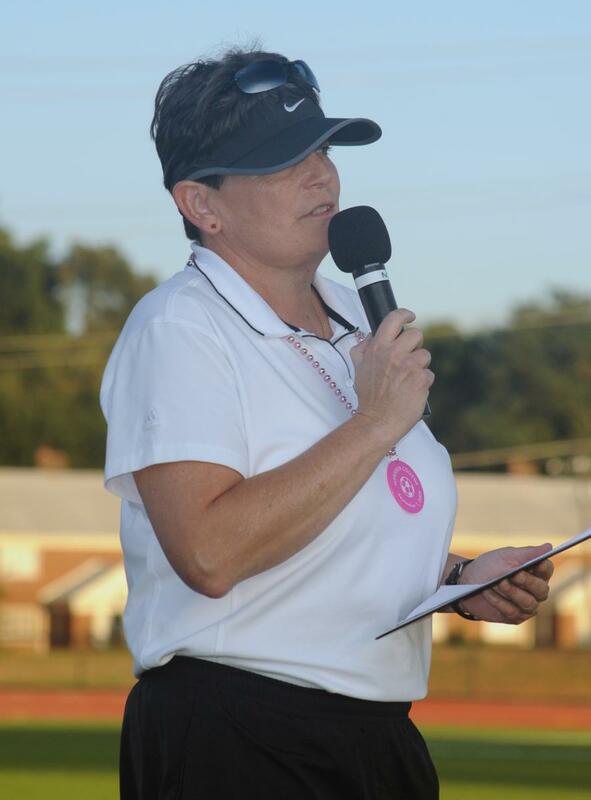 Sharing her knowledge and enthusiasm of sports makes her a great partner for area events. And although she has a lot on her plate, Myers’ positive attitude and outlook on life never wavers. Myers does it because she loves it, and that joy is infectious. Weaver said Myers was never a micromanager; even though the AD wore many hats, she encouraged her staff to come up with ideas and run with them. Weaver, who now works at UNC’s Kenan-Flagler Business School, often thinks of Myers when she has a decision to make, in sort of a “what would Jackie do?” way. Myers, a member of the Greater Raleigh Sports Alliance’s Advisory Board, is proud of the success and growth Meredith has had, change that anyone driving along Hillsborough St. can see first-hand. The athletics department’s “pride and joy” is the track and soccer and lacrosse field on the southeast corner of the campus. Lacrosse is one of the sports that Meredith has added in Myers’ stint, and the Avenging Angels have quickly become a program to be reckoned with in the USA South and beyond. They won their first NCAA tournament match a season ago, when they were third in the nation in scoring and scoring margin under coach Lauren Scott. The track facility hosts Division III competition as well as some world-class runners each summer. The Sir Walter Miler, a premier national event in track, has helped grow the Meredith name to local and national audiences. 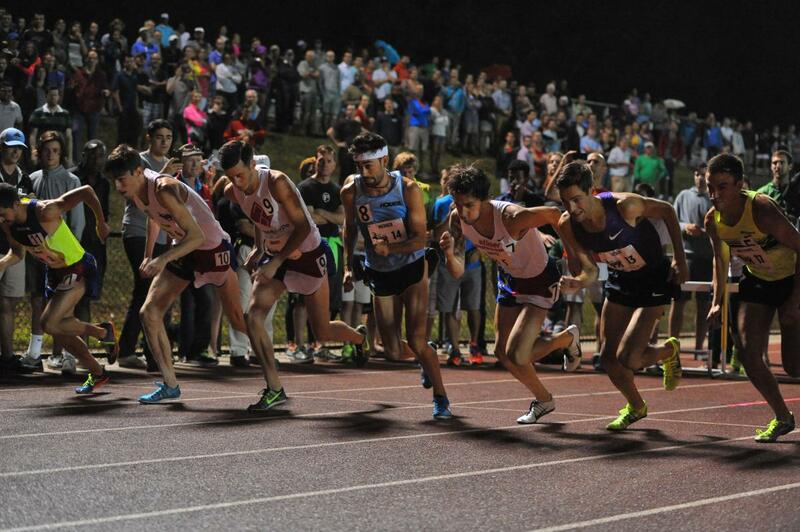 The series of races on the first Fri. night in Aug., which aim to have men’s milers break four minutes and women run faster than 4:30, has grown in popularity and found a home after initially being run at a local high school. Track and field is the one sport that was offered at Myers’ high school—she instead played team sports at the local YMCA. She wishes she had been born just a bit later, to take advantage of Title IX and the opportunities it created for women. On occasion, she has to remind athletes and coaches about the strides made in women’s athletics, but she remains a fan of the Division III model—playing for the love of the game, not for scholarship money or potential professional glory. Instead of coaching teams herself—as she did in multiple sports at Pfeiffer College, then Elon, and also at Pennsylvania’s Geneva College—today she’s coaching coaches. And Meredith has gotten excellent return on investment since the decision to hire Myers 17 years ago: New sports, new facilities, a new conference and a new brand. She didn’t do it all herself, and she’d never take credit for it if she did, but Myers played a key role in where Meredith athletics is today and where it is headed.